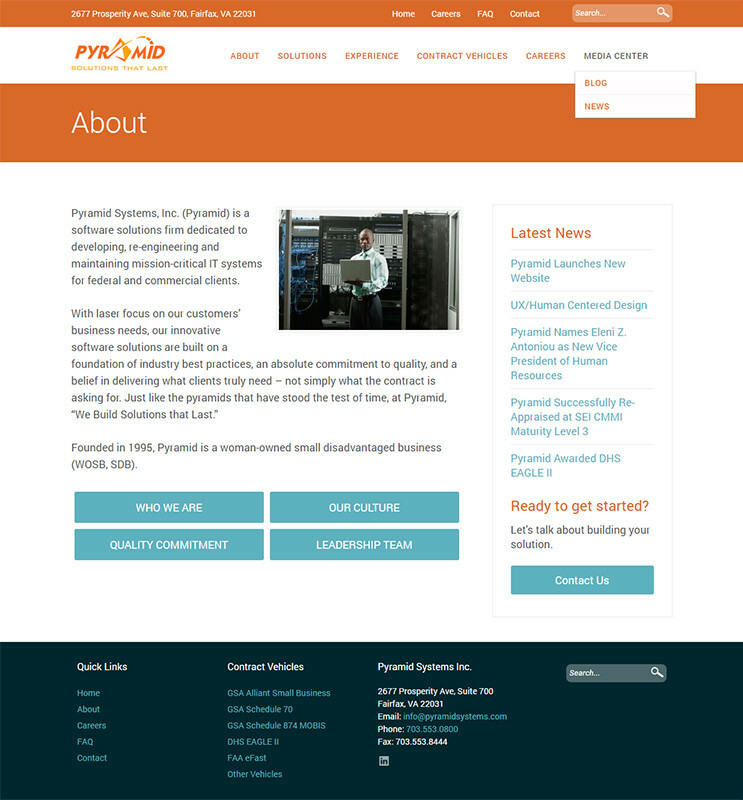 Pyramid Systems has built a distinguished reputation as a “go to” firm for developing and managing mission-critical technology systems for U.S. government and commercial organizations. Pyramid understands that such systems have to work, every moment of every day. While the company was growing and innovating with clients, its website was getting left behind. The site no longer reflected the company’s capabilities, experience and strengths. Pyramid turned to Boscobel to design and build a new company website. One that would reflect how special Pyramid is today. A site that Pyramid would be proud to share with clients, friends and family. Boscobel first took the time to really get to know what makes Pyramid tick. There was no doubt that the company was technically competent and customer-focused, with a knack for building innovative solutions based on client need. What Boscobel learned from the employee interviews, though, was exactly what a special place Pyramid is to work. The people…the culture…the commitment…are unlike many in the GovCon technology world. Pyramid hires really great people and provides a work environment that fosters collaboration and camaraderie – with a relentless focus on the mission of each client. The result? A dynamic, thriving, fun company. Boscobel captured the essence of Pyramid and built a contemporary, responsive website that builds on Pyramid’s established brand. Supported by the addition of updated executive photos, Boscobel re-wrote the site to better reflect the company’s commitment to process, agile software development strength and expertise with mission-critical systems. Then… Boscobel sprinkled employee quotes throughout the site, to help tell the Pyramid story from the people who know it best. Pyramid’s new website is well-organized with inviting, intuitive navigation. 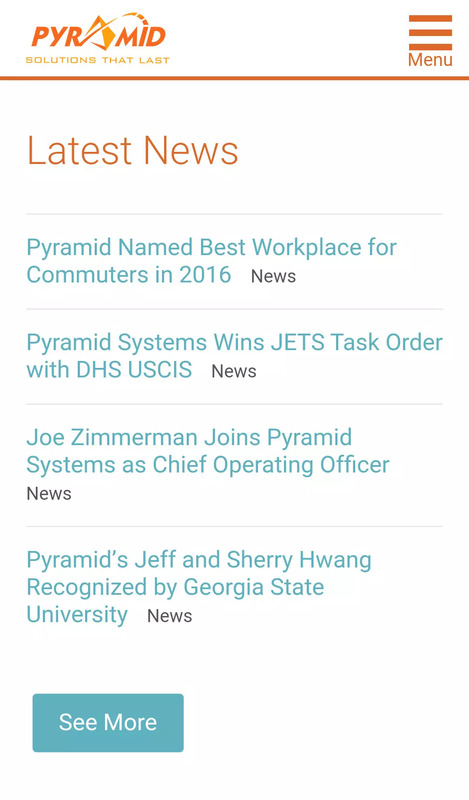 It’s easy to update, so Pyramid can quickly and confidently keep its community up to date on industry trends and company news. And, with Google Analytics, Pyramid is able to track visitor behavior and trends. Within the first few weeks, Pyramid experienced a significant increase in visitors to the site, especially from individuals exploring the Careers section. As the company grows, the website will continue to be one of the first impressions for new employees – helping to connect great people with an exceptional company. Everyone has been raving about our new website! We are all proud to direct our clients, colleagues, partners and family to our site. Thank you!